So I heard you like Decks run by snippy Tsunderes. 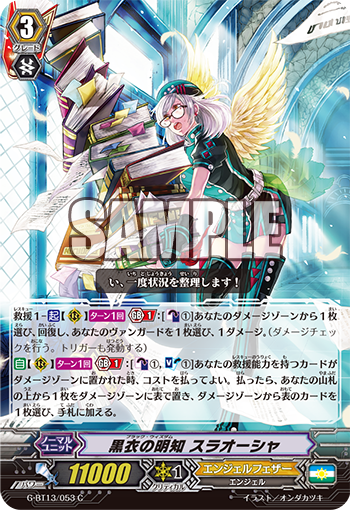 Rescue 1 – ACT (RC) 1/Turn Generation Break 1: [Counter Blast 1] Choose 1 card from your Damage Zone, Heal it, then choose 1 of your Vanguards, inflict 1 Damage. AUTO (RC) 1/Turn Generation Break 1: [Counter Blast 1 & Soul Blast 1] When your card with the Rescue ability is placed in the Damage Zone, you can pay the cost. If you pay it, place the top card of your Deck into the Damage Zone face-up, then choose 1 face-up card in your Damage Zone, add it to your hand. AUTO (RC) Generation Break 1: [Place this card on the bottom of the Deck] During your turn, when your card is placed in the Damage Zone, you can pay the cost. If you pay it, Soul Charge 1, then choose 1 Normal Unit and 1 Trigger Unit from your Drop Zone, return them to the Deck, then shuffle the Deck. For Today’s card we’re introducing the following from the 13th Booster Pack “Ultimate Stride” (on sale November 17th, 2017): The 《Angel Feather》 “Rescue” Support Unit, “Black Wisdom, Slaosha” and the Unit “Kind Care, Saltael”. “Black Wisdom, Slaosha” has a 【Rescue】 Skill with an Act ability that lets you Heal 1 card from your Damage Zone, and then inflict 1 Damage to your own Vanguard! It’s a powerful Skill that lets you activate 【Rescue】 as a Rear-guard. And its second ability is that when a card with 【Rescue】 is placed in the Damage Zone, you can pay the cost to place 1 card from the top of your Deck into the Damage Zone, and then add 1 face-up card from your Damage Zone to the hand. It’s a very handy card if you want to add vital cards in your Damage Zone back to your hand! On top of that, “Kind Care, Saltael” is the long awaited Deck recovery card for 《Angel Feather》! During your turn, when a card is placed in the Damage Zone, you can place this card on the bottom of your Deck to Soul Charge 1 card, and then place 1 Normal and Trigger Unit from your Drop Zone back to your Deck and then Shuffle! This way you can recover cards you burn through via 【Rescue】, adding them back to the Deck. These two cards are sure to strengthen 《Angel Feather》 Decks! We’ll be introducing more cards from the 13th Booster Pack “Ultimate Stride”! Please look forward to it!